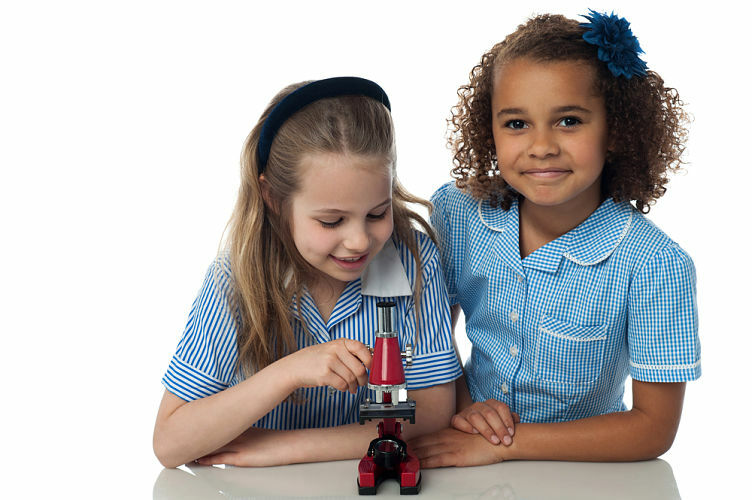 At Fab Science, we are passionate about engaging children in science from an early age. 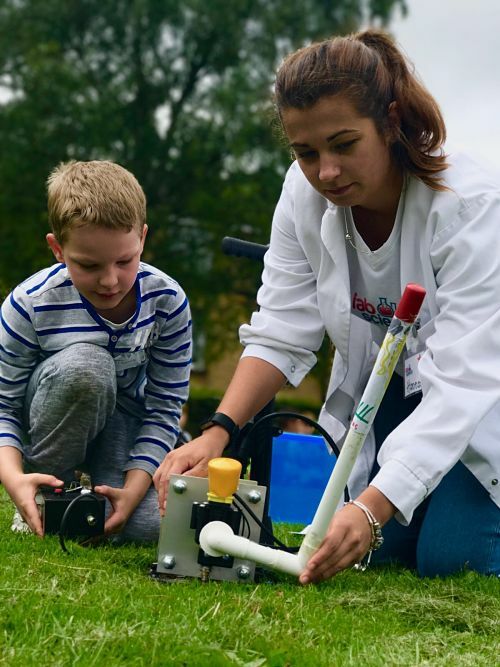 Our workshops are carefully designed by a qualified science teacher to boost science learning through practical, hands on experimenting and inspirational demonstrations. Every session is complimented by a classroom pack, offering teachers resources and ideas for follow-up work to maximise learning. Choose from a theme day which can be shared by several classes across the school or a curriculum-linked workshop for a specific year group. Our most popular theme day; wizarding scientists will wow your children with potions and spells. 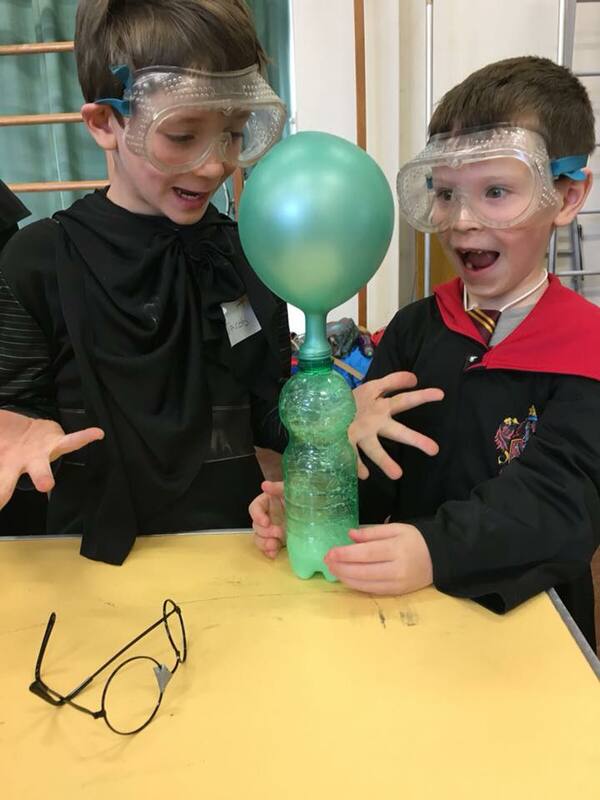 This exciting introduction to chemistry includes colour-changing potions, magically inflating balloons, toothpaste for giants and a truly magical dry ice demonstration. Quite simply the best potions class outside of Hogwarts! Lots of cool tricks with air pressure, gravity and inertia. See an egg disappear into a bottle and a tin be crushed by the air around it. Learn about flight and get the chance to launch rockets powered by air. Suitable for EYFS, Key Stage 1 and 2. Create a crime scene in your school hall! Your young forensics scientists will need to investigate fingerprints, DNA, fibres, footprints and more to match the suspects to the clues. Suitable for Key Stage 2 only. Developed as a special request for a class topic of Charlie and the Chocolate Factory, this is now one of our most popular workshops! 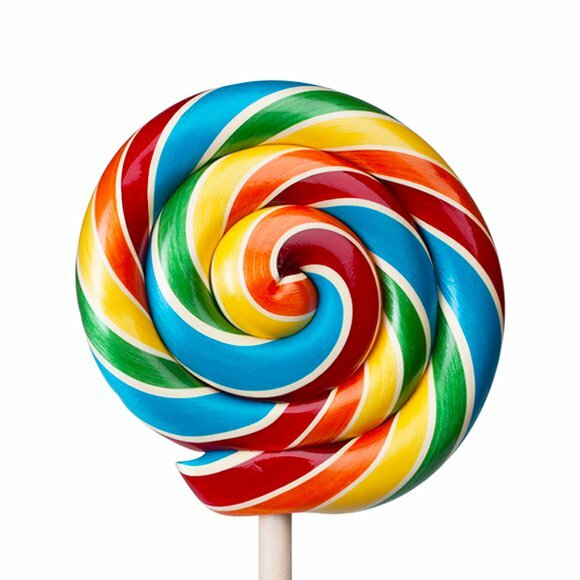 Sweetie-based experiments that Mr Wonka would be proud of. 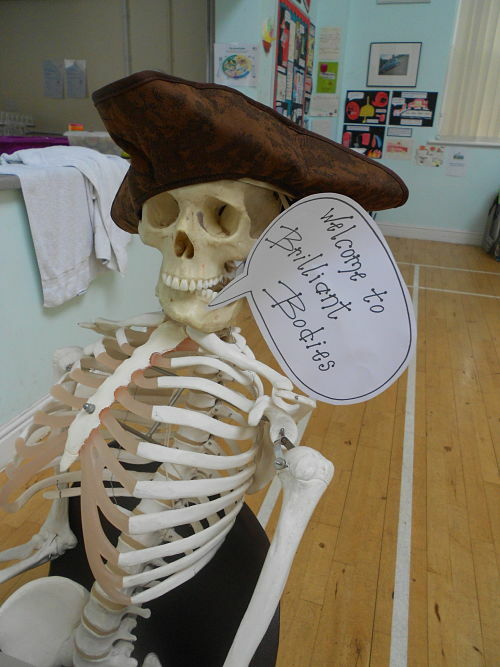 Mrs Johnson of Summercroft Primary described it as “the best science workshop that I’ve seen in my time in teaching”. 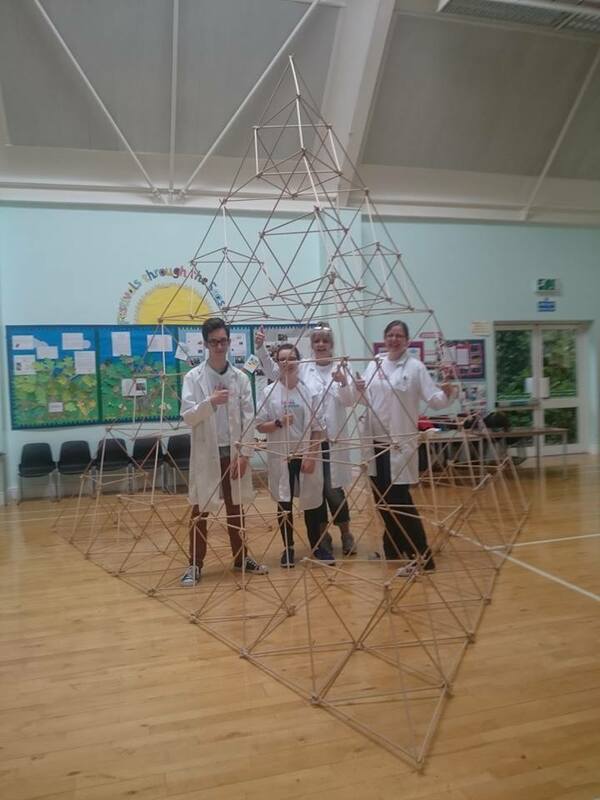 Use teamwork and engineering skills to build a giant tetrahedron. The modular system allows every child to have their own part in making this 4 metre high structure. It’s so big, we can fit the whole class inside it for a photo (carefully!). Cover all the statutory requirements of Year 4 electricity by experimenting with components and constructing circuits. Children join hands to become a human circuit and use their new electrical knowledge to build burglar alarms and games. Finish off by making sparks fly with the Van de Graaff generator! A (very gooey) interactive demonstration of the journey of your lunch through the digestive system. Children get a chance to investigate enzymes and learn about how food is broken down. We look at food to start a discussion on balanced diet which can be extended in class. Children know that solids are solid and liquids flow but what do gases do? Find out how amazing air really is by using it to make things fly, float and sing. Pupils learn about the Bernoulli effect and air pressure through demonstrations and hands-on activities. A super-cool dry ice demonstration is an optional add-on that really brings gases to life. Use a range of tests to classify rock samples, make fossils and learn about the rock cycle using chocolate! This session can also include an environmental aspect with an investigation of acid rain. Covers all areas of Year 3 Rocks curriculum. Extend pupils’ work on classifying materials with a look at smart materials, non-Newtonian fluids and polymers. 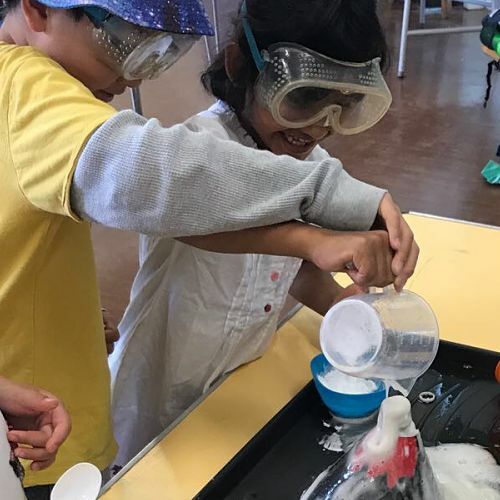 Children investigate stretchiness and make their own slime. An extended version of Electrickery 1, with more emphasis on investigating the effects of changes to circuits and using circuit diagrams. 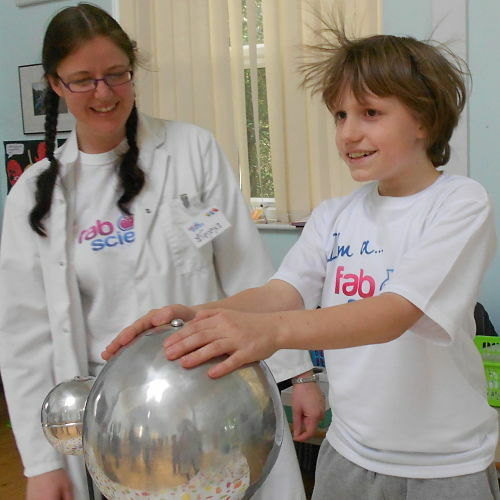 Build a quiz machine and try out the Van de Graaff generator. Start off with a gooey ‘surgery’ interactive demonstration to find out about major organs of the human body. We’ll dissect real hearts and lungs, with a chance for children to see and touch the valves and blood vessels. Investigate lung capacity and heart rate and design a longer-term experiment to continue in class. Choose from rockets and parachutes (outdoors) or rocket-cars (inside or out) to learn about air resistance, friction and gravity. 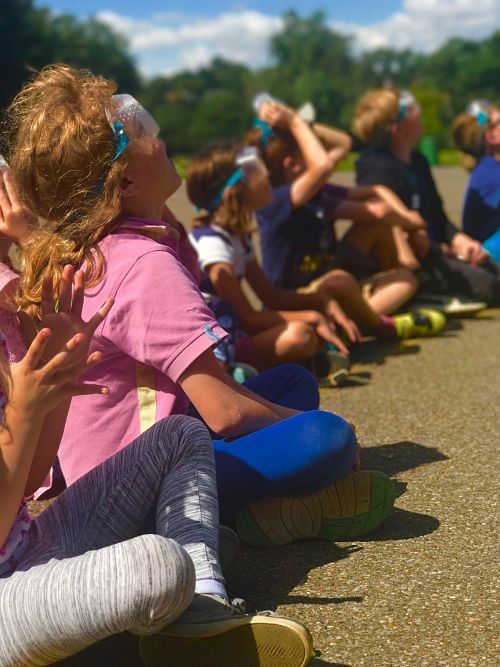 Children build the rockets, parachutes and cars from scratch, thinking about aerodynamics and power-to-weight ratios, then launch using compressed air. Linking to evolution and inheritance, All About Me investigates what makes us unique. 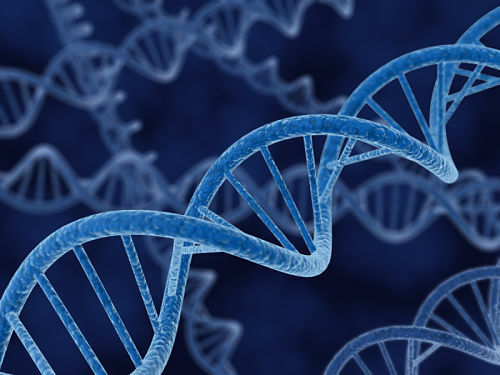 DNA, fingerprints, our genes, the features that we can see and those that we can’t. This is where chemistry starts to get real! Use pipettes and test tubes to learn about chemical changes with a variety of weird and wonderful concoctions. 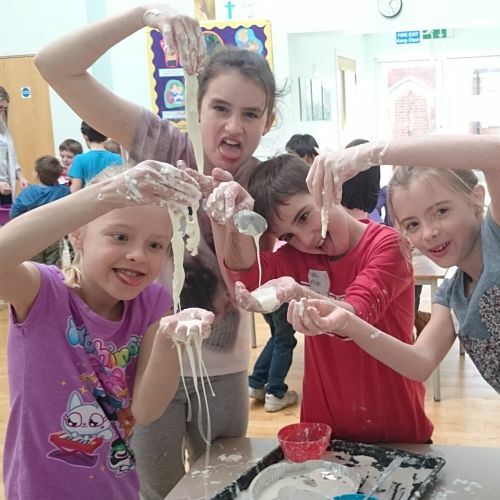 We also look at smart materials and polymers and investigate how to make the best slime.